Chepstow Racecourse01291 622260work RacecourseChepstow Racecourse has it all – beautiful countryside, a friendly, charming atmosphere and an impressive racing pedigree. Superbly located between Bristol and Cardiff and close to the M4, M48 and M5 with excellent links to many parts of the UK, the picturesque Wye Valley provides a striking backdrop to 440 acres of historic parkland. A day at the races is as casual or as formal as you want to make it. For some it’s a get together with friends, for others it’s an excuse to dress up, especially on Ladies Night when many ladies get dressed up and wear hats – not obligatory, but great fun! Families are always welcome with accompanied children under 18 entering for free and free entertainment on certain days. There are live music race nights with big name bands and family days featuring free children’s entertainment in the summer, and the chance to see some of the very top horses in the country through the winter jumping season. The jewel in the crown is the Coral Welsh Grand National run every year on 27th December. Chepstow Racecourse has it all – beautiful countryside, a friendly, charming atmosphere and an impressive racing pedigree. 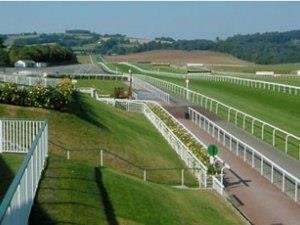 We look forward to welcoming you to Chepstow Racecourse.